The spirit of the pulps lives on in Hero Games’ premiere fiction release, Astounding Hero Tales. Lost jungle temples, mysterious crime-busters, gallant air aces, and unspeakable cosmic horrors share the spotlight in this anthology of all-new stories by such masters of the fantastic as Robert Weinberg, Will Murray, Darrell Schweitzer, and David Niall Wilson. 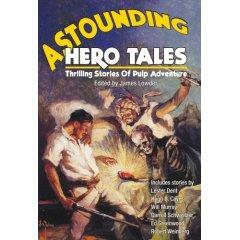 Astounding Hero Tales also boasts a previously unpublished weird mystery by Lester Dent, creator of Doc Savage, and a foreword and original dark crime yarn by legendary pulp veteran Hugh B. Cave.